As some of you may or may not know, I have a small t.v. show on the local access t.v. here in Billings. Local Access is the same channel as the School Board and City Council Meetings air. It’s for The Museum of Women’s History. I have the honor of interviewing interesting women about their lives, passions, jobs and anything else they want to tell me. Everyone has a story and I enjoy hearing them and sharing them with my viewing audience. We keep copies of the interview DVD’s and the interviewees bio’s in our Museum library. If someone ends up researching any of the women I have interviewed, they can watch the DVD and read the bio provided. 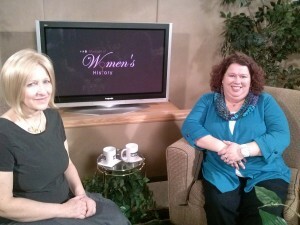 This week the tables were turned on me and I was in the hot seat interviewed. My past guest, Souther, a local artist and published author asked if she could interview me. She is part of Toast Master’s and to move up a level in the group, she had to perform and interview with someone. I must admit I didn’t wan to do it. I like ASKING the questions. I talked about it with my friends, the Museum board and family and they all encouraged me to go for it. Ugggggg! I filled out the questionnaire that I ask my guest to fill out. Which helped show me that I really need to tweak that thing and make some changes. I filled it out the way I would want my guests to fill it out to make it easier for Souther to have some questions information to pick from and not only a few items. I think I over-shared. My goal was to be an easy first time interview for someone. Blah, blah, blah, blah. We ended up shooting the show twice. The first time we were both so nervous that it didn’t turn out as well as I had hoped. I’m kind of glad the first one didn’t turn out. For my first interview I decided to wear a tan jacket and a cream top underneath that. I didn’t realize that they had painted the studio since my last interview. They painted it brown and now have brown furniture which means I just looked like a big fat pale bobbing head. I was so nervous that I stuck my mascara wand in my eye and had a lovely black mark on my contact. Little things like that made me very glad that it didn’t turn out. Tuesday was the big day! I like to tell my guest’s that an interview is very easy. After all they are talking about a subject that they know best, themselves! I think the big fear is not know what questions the interviewer is going to ask you. The interviewee knows what information they provided, but what will the interviewer feel is interesting and want to talk about? It’s the fear of the unknown. However, on the plus side I wore bright colors so I knew I wouldn’t blend in with the walls. Score!! It was time to go put our microphone’s on and that meant this was really going to happen. I normally sit on the left side of the stage, so it was kind of sick and wrong to sit on the right side. I fiddled with my mic and Souther put her mic on. I kept telling myself to only look at her and not stare at the cameras. That is what I tell my guests and I hoped that I would be able to remember. I kept kicking my legs back and forth until it was time to air. We were given out countdown that we would start filming and I had one more bout of butterflies. I had to tell myself that I would not be the one to start the program and just let Souther handle everything. I’m not a control freak by nature but that was a hard one to let happen. Souther asked me a questions, I can’t remember what it was, and I said something about feeling like I was on Barbara Walters. There is a countdown clock in the studio that I couldn’t see as it was behind me. When Souther would glance at it I would get anxious because I had no idea how much time we had left. Was I talking too long about topics? Was I too short on topics? Was my wondering eye up behind my head? Was I fidgeting like someone jonesing on meth? When I interview people I don’t fidget as I know what I’m going to ask and know where I’m going. The whole waiting for the next question made me jumpy. She was good at keeping the flow going and no awkward pauses at all. Talking about yourself is harder than I realized. One doesn’t want to come off as a show off or know it all but you have to talk or how else will people get to know you? I found her questions good ones and she had nice follow-up questions as well. It kind of gives you a mini rush that you are telling people about your life and they will perhaps learn things they never knew about you before. I’m not sure if that is a good thing or a bad thing. One of the last questions she asked was who was my favorite interview? That one stumped me as I don’t have a favorite. Each woman who has agreed to be interviewed by me has been interesting in her own way. I couldn’t pick a favorite it would be like picking a favorite child. You just don’t do that. However, I did tell her that one of my biggest interview scores was interviewing Linda McCulloch, Montana’s Secretary of State.! She was in Billings in August to honor our business The Rubber Stamp Shop and graciously agreed to be interviewed on my little show. That gave me a big head for a while. The interview will be streamed though the Community Seven website. It will air on tonight at 6pm Mountain Standard time. It will also air for the next several Tuesdays and Thursdays at 6pm. Mountain Standard Time. Here is the link if you want to tune in and watch it stream over your computer. Once you click that link, on the left side the top button says, “Watch Live” click that and you can watch the show. Well? Don’t leave us hanging. How did it go? How did you feel after? Do you have a new appreciation for….? I’m glad you had a much better time . I am going to try to watch it tonight. I am sure you did a great job. You are a special lady. I am looking forward to watching it tonight ~ Great prime time TV for sure!! I bet you did a fantastic job. You are so awesome and I am sure the interview is wonderful. Good call on the do over and wardrobe change. You would have faded into the background with those colors and you are definitely not one to do that. So happy that you had such a positive experience. Way to go!